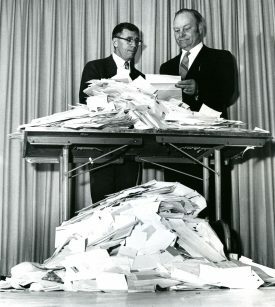 Share the post "What’s in Season from the Garden State: Jersey Tomato Throwback – Ramapo Tomato – 50 Years as a Home Gardeners’ Favorite"
Bernie Pollack (left) with the president of the Vegetable Growers Association of New Jersey in 1968 with the pile of mail orders for Ramapo tomato seeds. The year was 1968. Beehive hairdo’s were the rage, as were cars with lots of shiny chrome. New Jersey was lush with diners, drive-in movies and roadside farmstands. And the Jersey tomato reigned supreme. In 1968, there were a number of “Jersey tomato” varieties on the market–products of prior decades of breeding tasty, tangy tomatoes by food canning companies, seed companies, universities, including Rutgers and farmers, but many were prone to disease, cracking or other problems. That year, after eight long years of breeding a hardy tomato and testing it on New Jersey farms, Bernard Pollack, a vegetable breeder at Rutgers New Jersey Agricultural Experiment Station (NJAES), released the Ramapo tomato. An F1 hybrid, the Ramapo was disease-resistant, had vigorous plant growth and produced beautiful, crack-resistant, delicious tomatoes. To distribute the seeds to home gardeners and small farmers, NJAES teamed up with the Vegetable Growers Association of New Jersey and placed an announcement in New Jersey newspapers, and the mail orders flowed in. The Ramapo was a hit. The vegetable agents and specialists at Rutgers thought it would be a good idea to get the Ramapo on the market again, but could not find a seed company to take on producing small batches of the hybrid tomato, which requires cross-pollinating two parent varieties. It wasn’t until 2007 that a connection was made with an overseas seed company that was willing to produce a few pounds of the Ramapo seed, and in 2008, forty years after its original introduction, the Ramapo tomato was back on the market. Thus was launched Rutgers NJAES “Rediscover the Jersey Tomato” program, and once again, the mail orders flowed in. Since the Rediscover the Jersey Tomato program began in 2008, the project has added three more classic Jersey tomato varieties to its portfolio: Rutgers 250, Moreton and KC-146 tomatoes. Each of these varieties has been resurrected by Rutgers to maintain the availability of tomato varieties that were once grown by Jersey tomato growers, and to support Rutgers current breeding efforts of producing commercial varieties for farmers that not only produce well, but taste good too. During the cold blustery days of winter, when longing for the juicy tomatoes of summer, home gardeners think about what selections to grow. 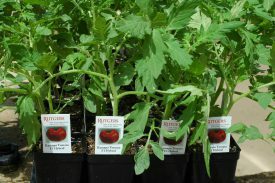 Rutgers has classic Jersey tomato seeds, home gardening information and diagnostic services to get the season started. Tomato seeds should be started indoors 6-8 weeks before the outdoor transplanting date (for ex, for Central NJ, start indoors: late March/early April; transplant outdoors around mid-May). 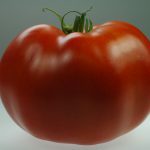 To get your tomato seeds started, see the order form for Rutgers 250, Ramapo, Moreton and KC-146 tomatoes. Ramapo F1 Hybrid tomato: Mid to late season; resistant to cracking and Verticillium and Fusarium wilt. Semi-determinate plants approximately 80 days to maturity. Medium – large sized fruit. Feedback from a gardener survey indicates that Ramapo tomato grows well in a variety of US regions. Subscribe to What’s in Season from the Garden State.